MackieMade Paper Creations: Paper Sweeties December Release Countdown! Hello! It is Day 2 of the Paper Sweeties December Release Countdown! More sneak peeks! 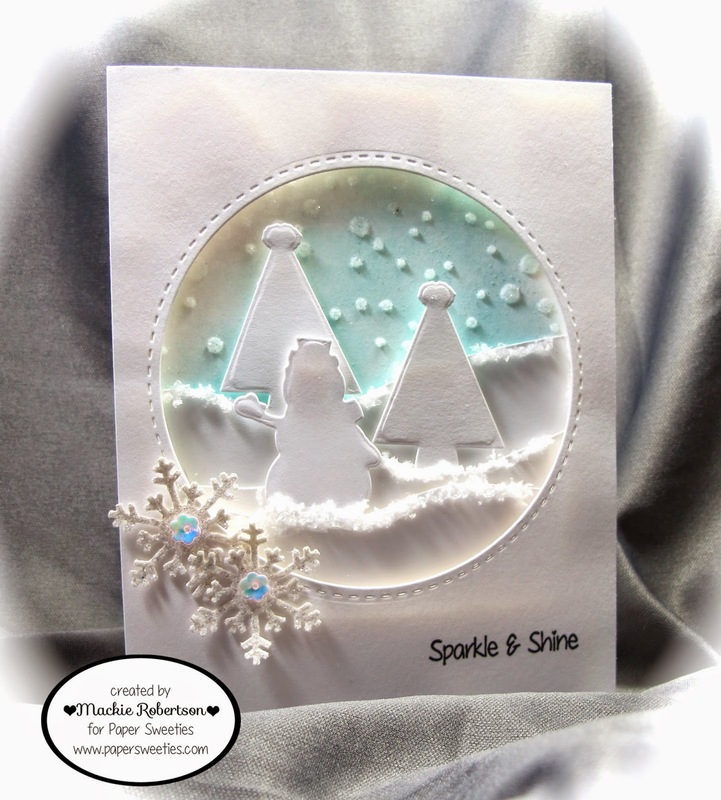 Today I am sharing a card that I made with some new Paper Sweeties Sweet Cuts called Snow Time. This set also has a matching stamp set! I have seen some similar cards to this one in blogland and I just had to try it! I sponged the card base with Sea Glass (SS) and Ardrey Blue (SS) inks. I spread transparent embossing paste thru a snow stencil, and sprinkled with Clear Rock Candy Distress (TH) glitter, before heat setting it. This made a beautiful, sparkly snowy background. I die cut 2 trees and a snowman with the Snow Time Sweet Cuts. I cut out some snow layers and attached the trees and snowman with foam adhesive to give dimension between each layer. I used white Flower Soft along the snow landscape edges to hide where I placed the die cuts. The glittery snowflakes and sequins complete the snow scene. The lighting in this photo almost seems like there is light inside the card, but it's not. Please hop along to see what my Paper Sweetie Teamies have made! The new releases will be available December 15th! Wow wow wow!! This is amazing!!!!! Absolutely gorgeous! Fab way of using the die cuts...LOVE!!! Mackie, I swooned when I saw this in the lineup! Drop dead gorgeous! Mackie this is just stunningly beautiful! It is a winter wonderland in a card! And gorgeous photo too!! So pretty Mackie! Such a beautiful scene! Holy smokes Mackie this is out of this world!! Wow, so PRETTY!! This is incredible. I love the dimensional snow you created with the embossing paste. Amazing!